Want a Cronut or Eggslut sandwich? 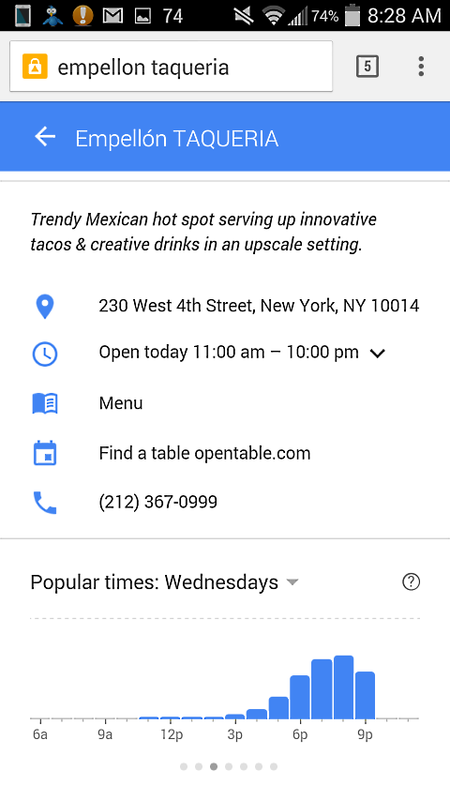 When you look up a restaurant on Google, you'll now see “popular times” for the business. Google searches just keep getting better (and simultaneously creepier). TechCrunch reports that the newest update just added “Popular Times” to search results for millions of businesses around the world—including many of your favorite bars and restaurants. You know what that means? No more waiting in ridiculous lines! If you’re an Android user, the Google app natively displays this info. iPhone and other smartphone users can see it by doing a Google search on your phone, which you can see in the image above. Now you can plan when you’re going to hit Blue Bottle and fly in and out the door with your New Orleans iced coffee. A Google spokesperson told TC that this very useful feature will only appear for places where visitors are “commonly curious about how busy it typically gets.” In other words, unless that tiny hole-in-the-wall Nepalese place you love is really popular, you may not ever see this feature show up when you search it. 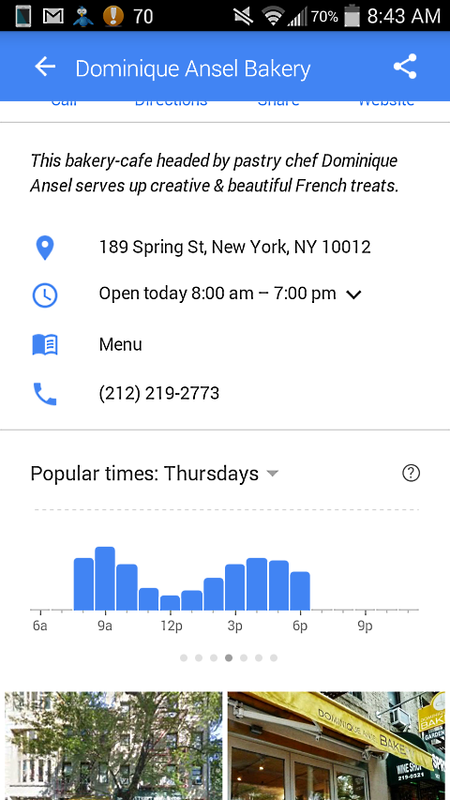 But thanks to this Google update, we now know that the best possible time during the week to hit up Dominique Ansel Bakery for anything at all (including the Cronut) is Thursdays. That’s the bakery’s least busy day of the week. Granted, it’s still busier than some places at their busiest, but braving the line is worth it, right?